Share Your Good News and Announcements With The Whole Community. One of the benefits of our community based website is the News and Announcements feature. We have a page dedicated to community news and events. Several members of our community are already using it to share what is going on in and around Marina. The best part is anybody can submit an article or an announcement. 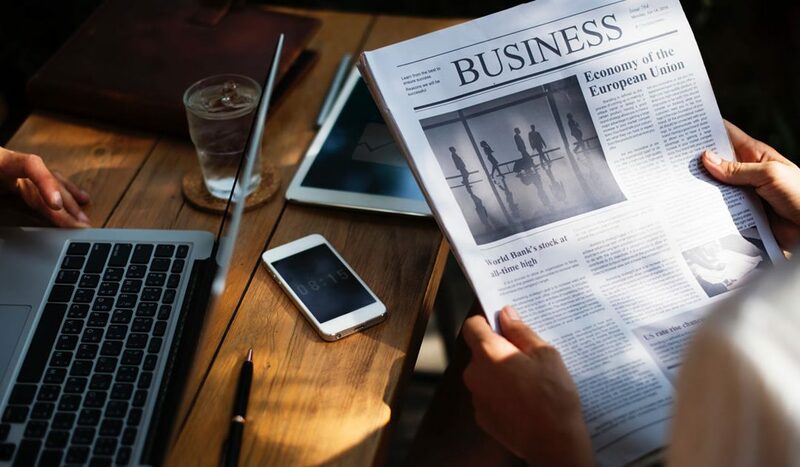 The news could be related to a new employee, a new promotion within your business, a featured business, a local hero, or just some of your favorite things to do in Marina. 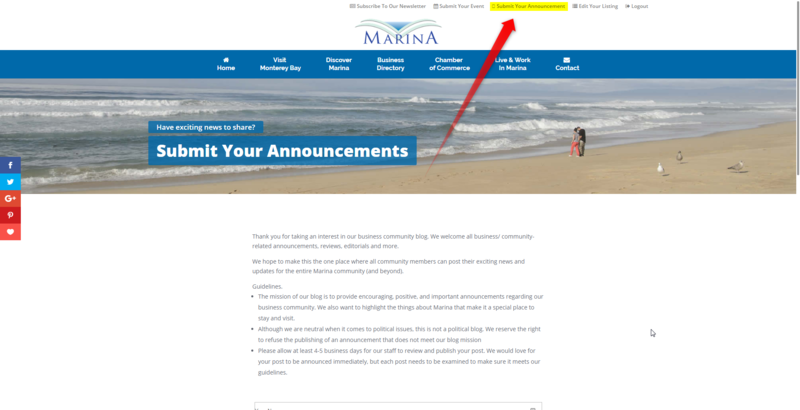 Submitting Your Article to the Marina Chamber of Commerce Website is Easy. So here is a video walking you through the process of submitting your announcement. And for those who prefer step by step tutorials, just scroll past the video. 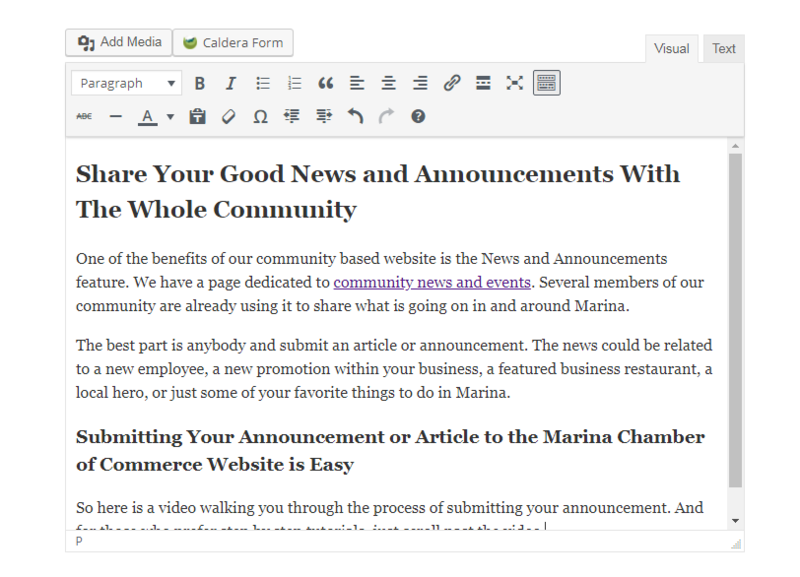 A Step By Step Tutorial For Submitting Your Article to the Marina Chamber of Commerce Website. On the top of every page there is a link called “Submit Your Announcement“. By clicking on this link, you will be directed to the submission form. 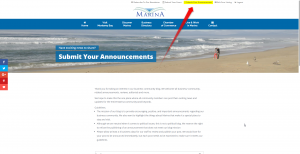 Marina Chamber of Commerce Blog Guidelines. As much as we would like to publish every single announcement, we do have some basic guidelines. Post Title: The title of the announcement or article. Post Tags: Phrases that help the search engine categorize your post. Add as many phrases as you think arte relative to the article. Category: As of now we only have one category to choose from which is News. Next is the content box. There are several formatting options which are best explained in the video. 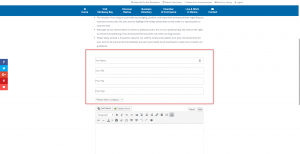 You can even add images and links using the toolbar in this section. Choosing The Right Featured Image. And last you will be asked to include a featured image. 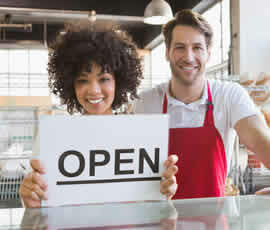 This is the image that shows up at the top of your article and when we share it on social media. We highly recommend that you use images that are 1200px in width and by 600px in width. It is not mandatory, but will show up better if you do. If you do not have photo editing software you can use a free online service such as Canva. It is free and has hundreds of premade images and templates to choose from. If you have your own images, that’s great, but if you need to find an image, I recommend using images that have the Creative Commons Zero license (CC0) which means you can use it without purchasing a license or giving attribution. Here are some great sites you can use to find such images. Once you are done, just click on submit and we will do our best to review and publish the article within 4-5 business days. It usually only takes 24-18 hours but only a few of us manage this part of the website and sometimes it just takes a few days to get to it. If you are looking to promote an event or an announcement for an event, we have a different form for that. And that is because we will keep including those events in our newsletter until the date passes at which time it comes off of our newsletter and upcoming events calendar. I will share more about that in my next article. For those who want to guest blog on a regular basis, we offer the option to join our team as an official author with your own bio and picture at the end of each post. Take a look at this end of this post for an example. 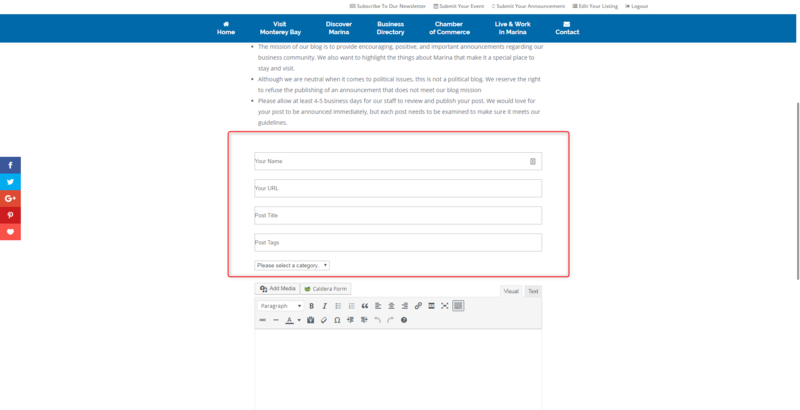 With guest blogging on a multi-author blog like ours, you can easily get yourself associated with other top bloggers building your authority on the topics you write about. Guest blogging can also lead to greater opportunities that go beyond writing posts. 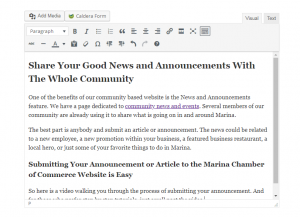 If you are interested in learning more about guest blogging on the Marina Chamber of Commerce Community Blog, check out this article. So whether you want to get your news out to the community, or want to become a regular guest blogger, you now have that capability through our new Marina Chamber of Commerce Community website. If you are interested in being a regular guest blogger, you can use our volunteer form to sign up.